People are living longer. The global average lifespan has risen steadily since 2000, and in the EU, it's topped 80 for the first time, according to a study released last year. As the pharmaceuticals, procedures and other breakthroughs that keep us ticking become more commonplace, so do the technologies that make it easier to access healthcare. Healthtech, like other verticals, has ridden an overall VC boom in the past several years. 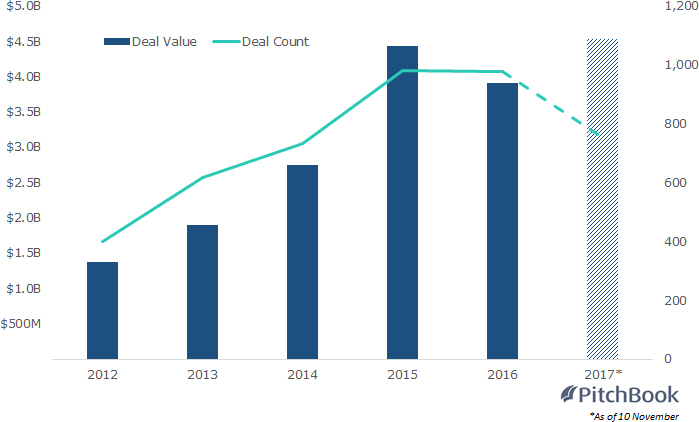 However, while volume and capital invested have both been slowing elsewhere in 2017, healthtech has already broken a record, with nearly $4.5 billion invested so far this year, though it's not quite on pace to match the past two years in terms of deal count. A closer look at the deals being done reveals that, at the top end at least, investors are shying away from lab-based biotech in favor of betting big on personalization across several facets. Clover Health, for example, raised $130 million in June to bolster its data analytics usage for preventative screening and insurance, marking the 10th-biggest deal of the year in this vertical. Outcome Health, the raiser of the largest healthtech round this year at $500 million (though the company is not without controversy, as of late), targets patients and caregivers with specific waiting-room ads. And Babylon Health, which raised the ninth-largest round this year at $60 million, has recently partnered with the UK's National Health Service to offer remote doctor consultations via Skype. The greater value in the sector can be attributed at least in part to the increased activity within bigger round sizes, per PitchBook data. Over a fourth of VC deals in healthtech so far this year have been above $5 million in value, compared with just over 15% last year—and it's not just the percentages that are growing. The number of deals over $5 million has been increasing overall since 2012, and, after a decline in 2016, is on pace to continue that trend this year, with 2017's activity already nearly equal to that of two years ago. While the US still counts for the majority of healthtech deals, other geographies have been eating away at that near-monopoly. 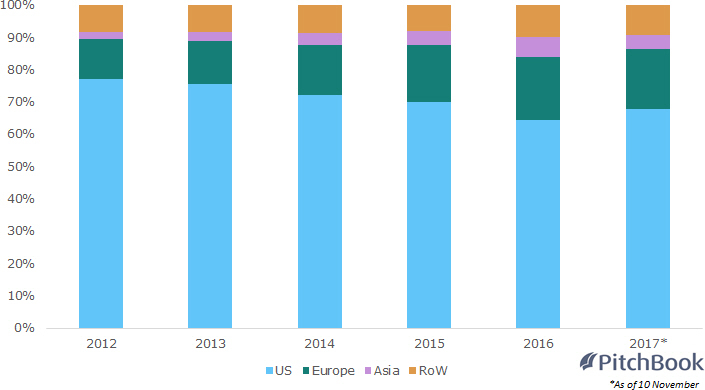 From making up 77% of global deals in 2012, US-based activity has gradually fallen, as activity in Asia and the rest of the world has ticked up. However, there are signs of a slight rebound, as this year's share of roughly 68% is ahead of the 64.5% the US registered in 2016. Of the 10 largest deals in 2017, eight have occurred in the US, with the other two in China. PitchBook Platform subscribers can access the full data on VC investments in healthtech.